Any you guys got any tips or tricks on how to convert type into single strokes for engraving? You can't just "convert to outlines", it gives you the entire shape. Not sure exactly what you are trying to do. Converting font to outlines will make an outline look like the font you had selected. So in your second post converting that T to the thin type T will not work because they are completely different. 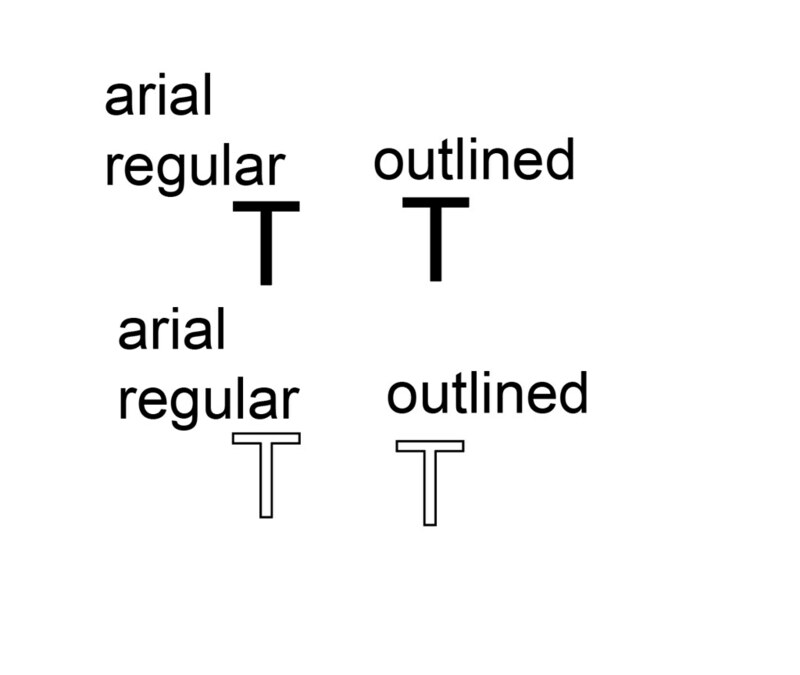 Arial "T" when outlined will look just like Arial but will no longer be a font. For engraving it needs to be a single stroke, not an outline of the font. As in the letter T, the stroke would run down the center of the vertical and the center of the horizontal portions, as in my example. So the engrave bit, when it chews through the metal, would leave the T looking normal, due to the thickness of the bit. Does the engraver have a program for that? very interesting, let us know what you find out! What about doing a choke trap? Not sure, tried a few things but no luck. Would think the software for the engraving would be able to do that as it seems pretty specific to that task. Not sure if this is a work around that would work but could you use a "light" font ie thin font type and use that to produce a thicker engraving? So light = regular? Not sure how engraving works so might not work at all. sadly, we are the engraver... using the Zund, hence the need for the single center line stroke. In Illustrator, outline the type, select the outline, offset path to some ungodly negative number (basically a major pinch), delete any extra paths and it's a done. I had 8 different names to do, and of course they all had to have their first, middle and last names. If only that image trace option Pabney posted would work for vector! It works perfect on an image in illustrator dang it! We are using OptiScout with our Colex Sharpcut and engrave using the milling and hatching settings. So we would use an outline of the type. In OptiScout set it up to use the router defined with the diameter of the bit we're using, and set up the rest with milling and hatching. Zunds being the Cadillacs of cutters surely has something of the sort. Not being a Zund operator myself, I don't know about this. I will surely check into it, thanks Skryber!